Several hundred people convened at the Local Union 606 International Brotherhood of Electrical Workers hall located on Virginia Drive in Orlando, Florida for the bi-partisan "Awake The State" protest, later marching down to Orange Avenue carrying homemade signs and chanting anti-corporate welfare slogans. The protesters were heading towards the Orlando Regional Chamber of Commerce building for the rally at the adjacent Senator Beth Johnson Park on South Ivanhoe Boulevard, where even more protesters stood in anticipation. The protests had a very large turnout, especially considering they took place on a weekday evening, and the spirit was lively and positive. Many cars honked their horns as they passed, participating in the event. This protest is to coincide with numerous others across the state to voice opposition to Governor Rick Scott's budget proposals and his "state of the state" address to the Florida Legislature in Tallahassee. Scott's budget plans to change public employee pension plans, cut education and health care budgets, and drop corporate taxes. The protests also echoed concerns in regards to the similar protests in Wisconsin, where conservative governor Scott Walker attacked workers and their right to collectively bargain. Politicians like Scott and Walker insist public employees must contribute more to their benefits packages but what they fail to explain is that government pension plans are already funded by public employees. Pensions are a form of compensation, where income is paid out at a later date then when it was actually earned - public pensions generally are cheaper to maintain then individual retirement accounts, but because of the mischaracterization from conservative organizations and politicians, public employee compensation plans have been been associated with budgetary problems and waste. The protests will likely make no difference to the governor - as usual, he is out entertaining his tea party constituency and avoiding answering questions to the media. “It’s easy to get distracted up here. It’s easy to hear what special interests want. It’s easy to hear what lobbyists want – because a they’re here everyday’’ he said. This is all talk, though - Scott has ignored calls from the majority of Floridians. Before Scott's budget cuts, he decided to refuse federal funding for Florida's high speed rail line, citing future uncertainty of government costs. 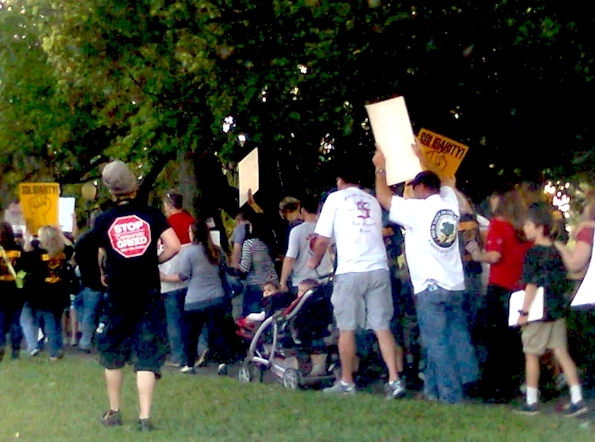 Even though a majority of Floridians and their legislators supported the rail line, private enterprise offered to cover budget overruns, and local municipalities offered to take control of the project from the state, Scott continued down his path of denial, all to the cheers of his conservative backers, who fund Scott's events - according to The Miami Herald, most of the pro-Scott protesters were retirees and bused in by right-wing group America for Prosperity. Former Republican state Sen. Nancy Argenziano participated in an Awake the State protest in Fort Lauderdale, criticizing the governor in a statement issued Tuesday afternoon.